"The girl doing the chipping seemed not to have a clue what she was doing. She made two attempts to chip Sassie." Much like an habitual drunkard who cannot stay off the bottle, modern man is seemingly unable to say no to technology. A rather poignant example of that herd mentality is to be found in the public's mindless acceptance of implanted microchips as the preferred method of keeping track of their cats and dogs. The masses are not totally to blame, however, in that just about all the major animal rescue groups in England, such as Cats Protection in Haywards Heath, Sussex, the Battersea Dogs and Cats Home in south London, the RSPCA, and the People's Dispensary for Sick Animals in Telford, Shropshire, have been busily ramming these pernicious devices down their gullets for years. They have been aided and abetted in their devilry by the totalitarians who call the shots in the European Union who in 2011 mandated that all cats and dogs traveling between its member states be fitted with these odious devices. More recently on April 6th, a new law went into effect across England and Wales that requires all dogs to be chipped. Violators as well as those who fail to keep their contact information current are subject to a £500 fine. Even in the land of the dollar bill the microchipping craze is spreading like an unchecked outbreak of malaria in that it has been endorsed by just about all shelters, veterinarians, and numerous municipal authorities as well. If the current trend continues unabated, the practice soon will surpass both collars and tattoos in popularity even without the benefit of a governmental fiat. Although there are numerous reasons why this trend is such an ominous development in the field of animal welfare, none so readily stands out as the appalling level of incompetence that exists within the ranks of those professionals that are charged with implanting them. Specifically, although surgically inserting these miniature identification devices between the shoulder blades is a straightforward, uncomplicated procedure, it is shocking just how many veterinarians are unable to do so without either crippling or killing cats. In addition to general incompetence, an overarching desire to make as much moola as possible within the shortest period of time and with the least expenditure of energy coupled with a lackadaisical attitude toward the well-being of their patients are sans doute contributing factors. Not surprisingly, the petit fait that implanting a microchip is an invasive procedure and as such requires not only competence but diligence as well often gets lost in such a perverse business model. That is perhaps even more so the case with those charities and governmental authorities that from time to time offer free-of-charge microchipping services to the public. A good case in point was the totally inexcusable pain, suffering, and lasting injuries inflicted upon a pretty three-year-old calico female named Sassie from Consett after her owner took her to such an event sponsored by the Durham County Council in early 2014. The details are a bit sketchy, but the unidentified individual doing the chipping so botched the procedure that she recklessly plunged the needle containing the device into Sassie's spine as opposed to inserting it between her shoulder blades. As a consequence, she was left paralyzed. "The girl doing the chipping seemed not to have a clue what she was doing," Sassie's thirty-one-year-old owner, Kristina Hogan, afterwards averred to The Chronicle of Newcastle-upon-Tyne on February 18, 2014. 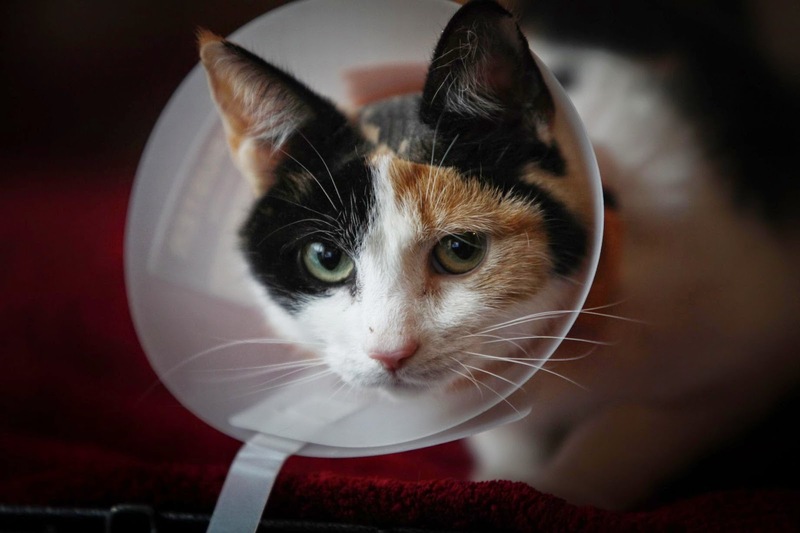 (See "Consett Cat Sassie Paralyzed in Microchipping Bungle.") "She made two attempts to chip Sassie." Although it has not been disclosed if the woman was actually a licensed veterinarian or merely an assistant of some sort, she additionally came within a hairbreadth of nearly killing Sassie. "On the second, she rammed the needle so hard into her she injected the chip between the first and second vertebrae in the neck, paralyzing her," Hogan continued. "If it had gone any further up it would have hit her in the brain, and if it had gone any deeper it would have perforated her spinal cord." As a consequence, Hogan was forced to rush Sassie to Croft Vet Hospital in Cramlington, thirty-seven kilometers north of Consett in Northumberland, where the microchip first had to be located with computer scans and then surgically removed at a staggering cost of £3,000. That was nothing, however, when compared to the damage that had been inflicted upon Sassie. 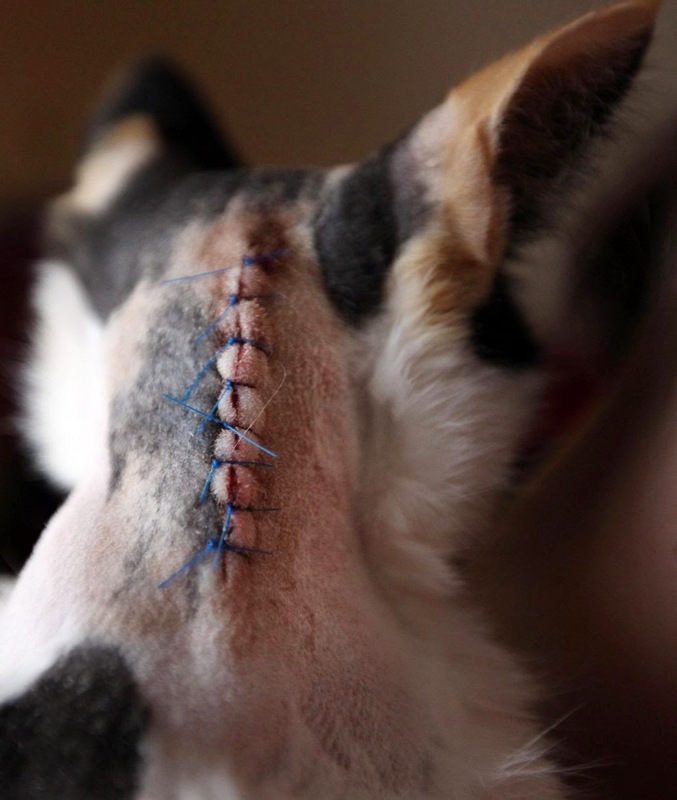 To begin with, eight stitches were required just to sew up her severely damaged neck. Following that, she not only was forced to wear an Elizabethan collar until the incision healed but to be caged for six weeks while she convalesced. Worst of all, the procedure robbed her of the ability to run and jump. "She just used to really enjoy being out -- if you opened the door to call her she wouldn't come and nine times out of ten you'd have to tempt her in with a bit of ham," Hogan confided to The Chronicle. "Now she'll never be able to go outside again because she's too slow to get away from predators." The full extent of her injuries was not expected to have been determined until after the cone and stitches were removed but since no additional articles concerning her have appeared in the English press, it is impossible to speculate on how she is progressing. All may not have been lost, however, in that some cats who have suffered similar fates eventually have regained some of their mobility. For its part, the Durham County Council has attempted to atone for what was done to Sassie. "We are extremely upset and sorry that this happened," Ian Hoult, its neighborhood protection manager, told The Chronicle. "We immediately apologized and have paid for all necessary veterinary care to ensure the animal's future well-being." In addition to leaving Sassie paralyzed, the bungled microchipping also has had a traumatic effect upon Hogan's three young children. "It's affected the children as well -- the kids were in tears," she told The Chronicle. "They can't go and give her a cuddle and pick her up because they're so worried they're going to hurt her spine." Although the toxicity of these devices coupled with the tendency of veterinarians to implant them at vaccination sites and on top of spines constitute the principal concerns, they are by no means the only ones. First of all, not all of them operate on the same frequency and as a result multiple scanners are needed in order to read them and that in the past has led to deadly consequences. Although proponents may trumpet their efficacy in reuniting lost cats with their owners, the statistics that they cite in support of their reasoning are misleading. That is because for every successful reunion there doubtlessly must be hundreds, if not indeed thousands, of chipped cats that are never found. One reason for that is the limited availability of scanners. Therefore, individuals who rescue cats from the streets and fields do not have any means of checking for implanted identification devices. Although collars and tattoos also have their limitations and health risks, they at least are visible to the naked eye and that convenience alone sometimes increases the odds that animals outfitted with them will be returned to their owners. They also have the advantage of being free of both exorbitant veterinary and database maintenance fees which, by the way, is another reason why practitioners and animal rescue groups are lobbying so intensely to have them replaced. At this very moment the USDA's diabolical Wildlife Services and the Idaho Department of Fish and Game are using radio-collared "Judas" wolves in order to track down and flush out other wolves from their dens. Sharpshooters then gun down the helpless animals from helicopters and airplanes. Considering the gargantuan lengths that the United States Fish and Wildlife Service has gone to in order to eradicate cats on San Nicolas, in the Florida Keys, and elsewhere, the species one day could find itself being treated every bit as cruelly as wolves. It accordingly is not a good idea for those who care about them to provide governmental agencies, rescue groups, and veterinarians with either the electronic means or the data that will make it easier for them to carry out their hideous crimes. A far more prudent alternative would be to rely upon close observation and conventional means in order to keep track of cats. Such a strategy has, admittedly, its limitations but a reliance upon technology and those groups and entities that champion it is definitely not the answer.